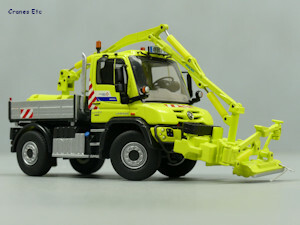 This model is a Mercedes-Benz 4x4 Unimog U 400 series which is a flexible utility vehicle with all-wheel drive ability. It is fitted with a Mulag MKM 700 Combination Mower. It is in the colours of Escota, which is part of the VINCI Group. It comes in a NZG branded box and inside it is held within a plastic display case. There is no information about the model or the real vehicle. 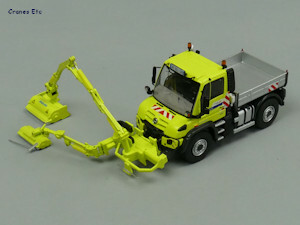 The Unimog has a detailed 4x4 chassis which is modelled in metal, and the wheel hubs are metal too. The tyre design is the same on all wheels. At the front the lights are painted and the Mercedes-Benz logo is modelled well. There is an attachment plate for the tool. 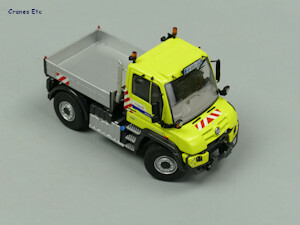 The cab is detailed with rigid lights, mirrors and number plate assemblies. Textured steps lead up to the cab and the graphics are detailed and sharp. 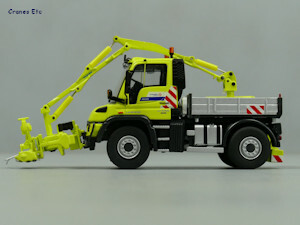 The vehicle type is shown as a U 430. Inside the cab there is a Mercedes-Benz logo on the steering wheel and the centre console is finely detailed with switches. Behind the cab the exhaust and air intake look good. The fuel and water tanks also look good with highlighted filler caps. The body is metal and the drop sides are detailed and non-functional, and the graphics are good. 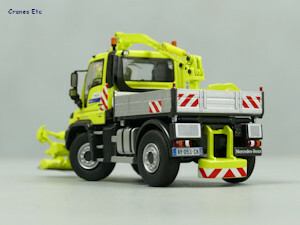 The rear lights have good looking plastic lenses and twin boxes have very fine grille texturing. 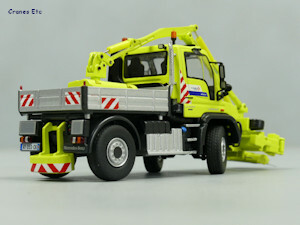 There is a number plate and counterweight. The Mulag mower is a well made part almost completely of metal. The ram jackets are plastic with a decent colour match. The large mower head has some sharp graphics applied. 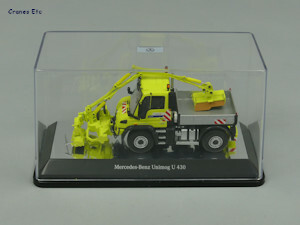 The plastic display case is good quality and it includes a name plate which denotes the Unimog as a U 430. 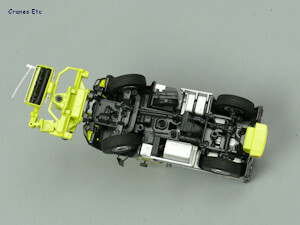 The model can be displayed in its display case, or removed by unscrewing two securing screws. 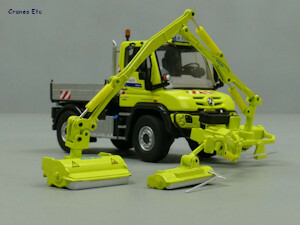 The Unimog rolls well and the steering works well and achieves a good angle. The mower can be attached or removed. The small mower can be clipped out of service or rotated and extended for mowing with the head being adjustable for angle also. The large mower boom also rotates and has three rams controlling the movement. The head is adjustable for angle and rotation. 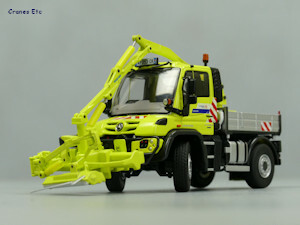 This is another well made Unimog by NZG with a high metal content. The paint and graphics are very good. It is a fully priced model. Unimogs are flexible trucks and this an interesting model variant with the mower attachment being nicely implemented. It looks attractive in the Escota colour scheme. 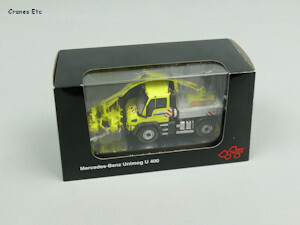 This version was announced in August 2016 in a run of 150 models.